GOD PARTICLES – A Creative Designer Factory| Logo Design and Graphic Design Company in Chennai. Diwali Vacation Notification for all Clients. 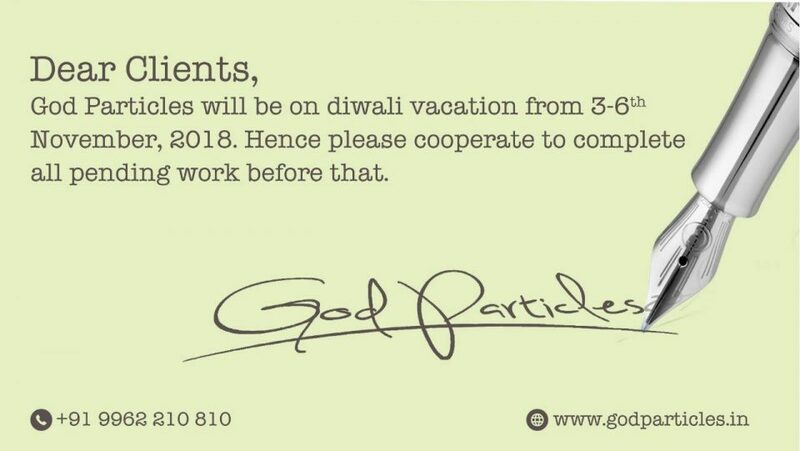 God Particles will be on Diwali vacation from 3-5th November, 2018. Hence please to complete all pending work before that. As we continue to grow from strength to strength adding pages to the story of success, we bridge the need for creative designs at affordable prices as we believe that we equally carry the responsibility of empowering the customer base of our clients by crafting unique conceptual designs that aid in achieving the objectives of growth and profit simultaneously. Logo Design and Graphic Design Company in Chennai.